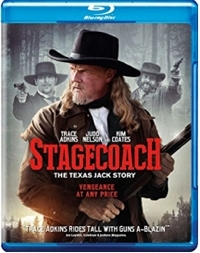 In the beginning, the film, shot in HD, looks promising enough, with some interesting camera work and a gritty, realistic depiction of a stagecoach robbery. But then it gets schmaltzy in the next sequence as we fast forward years later and see a level of domesticity and niceties you got from ‘50s sitcoms like Father Knows Best and Leave It to Beaver. Nathaniel Reed (Adkins) has put his past behind him and is a hardworking man now who’s married to the local teacher (Michelle Harrison, The Flash). They want to start a family, but times are tough (when weren’t they, for average folks?) and the villainy is shifted to the bank, which is ready to foreclose on them. From those clichés and cheesy moments the tone shifts again as the film becomes unintentionally funny with the appearance of a one-eyed marshal named Calhoun (Kim Coates), a former victim of the stagecoach robbers who now has a female sidekick —the two of them acting as if they’d been cast as The Joker and Harley Quinn or characters in a Tarantino movie. Robbing a stagecoach suddenly seems less of a crime than scene stealing as these two monologue and methodically pursue the individual members of the gang that robbed him when he was working for the stagecoach line. “You shoot my eye out, that makes you guilty,” he drawls. Lines like that kind of tickle the funnybone, as does “It’s gonna take a lot more than dyin’ to kill Sid Dalton” or “There’s a bad hombre after us.” In fairness, there’s an inconsistency in the dialogue, with some lines ringing true and others seeming labored or studied or unintentionally funny—but that inconsistency draws attention to the dialogue, or rather, the way that those lines are delivered. 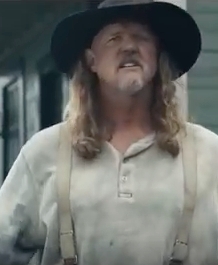 Adkins is stiff and his lines feel as if they’re labored; without a recognizable name he’d be an extra at best, rather than the outlaw-turned-respectable-turned-outlaw-with-an-alias. Meanwhile, Coates is over-the-top and flamboyant by comparison. As foils, they make for a curious pair, and they draw attention to the fact that they’re both acting. Another head-snapper is the disjointed time sequence. After establishing a straight progression forward suddenly it goes from “Three Weeks Later” to “Two Weeks Earlier.” Huh? Put it this way: there are far better Westerns out there.